The evidence for the presence of thermite at the World Trade Center (WTC) on 9/11 is extensive and compelling. This evidence has accumulated to the point at which we can say that WTC thermite is no longer a hypothesis, it is a tested and proven theory. Therefore it is not easy to debunk it. But the way to do so is not difficult to understand. To debunk the thermite theory, one must first understand the evidence for it and then show how all of that evidence is either mistaken or explained by other phenomena. Here are the top ten categories of evidence for thermite at the WTC. Molten metal: There are numerous photographs and eyewitness testimonies to the presence of molten metal at the WTC, both in the buildings and in the rubble. No legitimate explanation has been provided for this evidence other than the exothermic reaction of thermite, which generates the temperatures required and molten iron as a product. The fires at Ground Zero could not be put out for several months. Despite the application of millions of gallons of water to the pile, several rainfall events at the site, and the use of a chemical fire suppressant, the fires would not subside. Thermal images made by satellite showed that the temperatures in the pile were far above that expected in the debris from a typical structure fire. Only thermite, which contains its own oxidant and therefore cannot be extinguished by smothering it, can explain this evidence. Numerous eyewitnesses who were fleeing the area described the air mass as a hot wind filled with burning particles. This evidence agrees with the presence of large quantities of thermite byproducts in the air, including hot metallic microspheres and still-reacting agglomerates of thermite. Numerous vehicles were scorched or set on fire in the area. Photographic evidence shows that cars parked within the lower-level garage areas of the WTC complex burned as if impacted by a super-hot wind like that described by the eyewitnesses. All non-metallic parts of the cars, including the plastic, rubber, and glass, were completely burned off by a hot blast. There was a distinct “white smoke” present—clearly different from smoke caused by a normal structural fire—as indicated by eyewitnesses and photographic evidence. The second major product of the thermite reaction is aluminum oxide, which is emitted as a white solid shortly after reaction. Peer-reviewed, scientific research confirmed the presence of extremely high temperatures at the WTC. The high temperatures were evidenced by metallic and other microspheres, along with evaporated metals and silicates. These findings were confirmed by 9/11 investigators and by scientists at an independent company and at the United States Geologic Survey. The elemental composition of the metallic microspheres from the WTC dust matches that of metallic microspheres produced by the thermite reaction. The environmental data collected at Ground Zero in the months following 9/11 indicate that violent incendiary fires, like those produced by thermite, occurred on specific dates. Peer-reviewed scientific analysis of these data show that the components of thermite spiked to extraordinary levels on specific dates in both the air and aerosol emissions at Ground Zero. Carbon nanotubes have been found in the WTC dust and in the lungs of 9/11 first responders. Formation of carbon nanotubes requires extremely high temperatures, specific metal catalysts, and carbon compounds exactly like those found in nanothermite formulations. Researchers have discovered that nanothermite produces the same kinds of carbon nanotubes. That finding has been confirmed by independent analysis in a commercial contract laboratory. A peer-reviewed scientific publication has identified the presence of nanothermite in the WTC dust. One of the critical aspects of that paper has been confirmed by an independent scientist. A visual comparison between nanothermite residues and particles found in the WTC dust is remarkable. There is also a great deal of indirect evidence for the thermite theory. This includes the attempts by the government agency NIST to downplay the evidence for thermite. It also includes things like a weak effort by Rupert Murdoch’s National Geographic Channel to discredit the ability of thermite to cut structural steel, which was itself roundly discredited by an independent investigator. It is now unquestionable that thermite can cut structural steel as needed for a demolition. Therefore, debunking the WTC thermite theory is not easy but is very straightforward. Doing so simply requires addressing the evidence listed above point by point, and showing in each case how an alternative hypothesis can explain that evidence better. Given the scientific grounding of the thermite theory, use of the scientific method, including experiments and peer-reviewed publications, would be essential to any such debunking effort. That is almost certainly why we have seen no such debunking. Instead, the people working to refute the WTC thermite theory have resorted to what might be called a case study in how NOT to respond to scientific evidence. Thousands of chat room comments and other posts yet not one peer-reviewed scientific article. Alternate hypotheses that have little or no evidence to support them. For example, the mini-nuke hypothesis and the “Star Wars Beam” hypothesis. Government scientists declaring that the evidence simply doesn’t exist. Attempts to exaggerate the meaning of the evidence, for example by saying that thermite or nanothermite could not have caused all of the effects seen at the WTC. Deceptive efforts to introduce the government contractors who created the official accounts as independent scientists. The last of these methods has been the most popular. Trying to debunk the tenth piece of evidence for WTC thermite, NIST contractor James Millette produced an unreviewed paper that purports to replicate the finding of nanothermite in the WTC dust. This was apparently organized in the hope that doing so would discredit all of the evidence for thermite at the WTC. Millette is well known for having helped create the official reports on the analysis of WTC dust. He was responsible for creating the form that was used to pre-screen all materials found in the dust prior to any analysis by official investigators. Those official reports did not mention any of the evidence listed above, in particular failing to report the abundant iron microspheres scattered throughout the WTC dust. Additionally, Millette’s official report team did not find any red-gray chips, let alone nanothermite. As he worked to debunk the WTC thermite research, Millette was still unable to find any iron microspheres. But he did claim to have finally found the red-gray chips. Curiously, he did not attempt to replicate the testing that would determine if those chips were thermitic. Claiming to have found the chips, Millette perfomed an XEDS analysis for elemental composition but failed to do any of the other tests including BSE, DSC, the flame test, the MEK test, or measurement of the chip resistivity. Having inexplicably “ashed” the chips at 400 °C in a muffle furnace, thereby proving that they were not the materials of interest (which ignite at 430 °C), Millette ignored the remainder of the study he had set out to replicate. Because he did not do the DSC test, he could not do XEDS of the spheres formed from the chips. Since he had still not found spheres in the dust, he could not test those and this allowed him to ignore the testing of spheres from the thermite reaction. Millette rested his case on FTIR, which I have also performed on chips from WTC dust but with a much different result. Like Millette’s paper, my FTIR work is not yet part of a peer-reviewed publication and therefore should not be taken as authoritative evidence. There has been less urgency to this supplemental work because what has been done to date has received no legitimate response from the government or from much of the scientific community. That sad fact should be the central point of discussion today. In any case, Millette attempted only one tenth of the tests in his struggle to replicate (or refute) one tenth of the evidence for thermite at the WTC. His un-reviewed “one percent approach” was nonetheless very convincing to many people, including some of the people who produced the official reports for 9/11. But it is obvious to others that Millette’s work was not a replication in any sense of the word. I’m looking forward to the peer-reviewed scientific article that finally does replicate the nanothermite paper or any of the other peer-reviewed scientific papers that document the evidence for thermite at the WTC. Hopefully, we can approach those efforts without concerns about the sources and without recalling all the deception and manipulation that preceded them. Until then, it is important to recognize the difference between the superficial appearance of science and the actual practice of science. Ignoring 90 percent of the evidence is not scientific. And replication of the 10 percent means actually repeating the work. If thermite debunkers and alternate hypothesis supporters can find the courage and focus to step through that challenge, maybe they can begin to add to the discussion. For example, see Joel Meyerowitz, Aftermath: World Trade Center archive. Phaldon Publishing, London, p 178. See photograph of the event on 11/08/01 that shows a stunning and immediate change of cloud-like emissions from the pile, from dark smoke to white cloud. Er, Kevin, I was at one time a professional proofreader and I am mildly obsessive compulsive about related issues? should be “produced.” Thank you. This is an excellent compilation of the evidence. Thanks. What saddens me about all of this is that 12 years after the events of September 11th, 2001, we are still in this stage. We KNOW that open air fires didn’t do this. We KNOW NIST is being dishonest. Let’s go beyond conjecture – science rules out all of the nonsense. Let’s determine WHO did it. They will provide the HOW. After the collapse of the WTC buildings were there hundreds, maybe thousands, of large structural steel columns in the debris with large diagonal molten cuts at each end? There were hundreds of flatbed trucks loaded each NIGHT at Ground Zero with steel columns and beams that had come down already cut to convenient 30 foot lengths to fit the flatbeds without need of further cutting. The loading was done at night to prevent public viewing of the tell-tale ends of the steel. Controlled Demolition, Inc. did state online that when they do a demolition job they arrange for steel to come down precut to 30 foot lengths to fit on flatbed trucks. There are photographs online of the exploding WTC Towers that show a large number of steel beams all of about the same 30 foot length thrust outward with the smoke and dust. Thank you for the work you do in keeping this subject alive. The molten metal question has always been on the top of my list of questions needing answers. I worked in an open hearth in Gary, IN in the early 60’s I understand the amount of time and fuel and conditions necessary for melting steel. I have not heard an explanation other than thermate that would provide these conditions. The oldest known piece of steel is about 4,000 years old. They didn’t have thermite back then, I don’t think, Harry. If Harry was working an open hearth furnace foundry he certainly knows that thermite is not involved in the process. Bellows for high oxygen = high temperature. There were no bellows in the pile of the WTC aftermath. Hybridrogue you are absolutely right you need a bellows to force air in for high temps, Besides the constant winds (which anyone who works in high rise bldgs can tell you is always present) There is also a bellows effect from the jetfuel, plus furniture computers and carpets and other combustibles all burning and the chimney effect of the elevator shafts. There were reports of explosions in the basement right? Elevators come crashing down removing the plug from the shaft allowing the wind that people reported on the ground floor of air being sucked up the elevator shafts and stairwells. Creating the bellows effect needed to exceed temps that the structure could withstand….creating the collapse. This is the construction of something plausible to get to a conclusion already held. 1) Wind that day is measured at 10- 12 knots at the top, 2) The fires temp at the crash site is measured. The temp. used in forging is approx 900 C and it requires coke or coal and a bellows and the metal does not become molten at that temp. In fact, the metal is quite strong at that temp. Forging requires rather powerful forces – many blows with a 4 lb hammer or hydraulic press. Inflammable carpet and office furnishing are not coke or coal, in addition to the heat sink characteristic of an interconnected stee structure – the columns of the 80th floor were 400 lbs. per foot. Heat that up with the bellows of a strong breeze and elevator shaft air to the point of orange color and do it in 50 minutes. Preposterous. Clinical denial – see a therapist. Thanks for the article, Mr. Ryan. Do you think Mark Basile’s attempt to raise enough money to submit the WTC dust to an independent laboratory is worthwhile? Would you think that a metallurgical analysis of Jonathan Cole’s thermate-melted steel worthwhile. Also, Millette claims in the paper to have done the MEK test. Hey Kevin…why don’t you have social media “share” buttons on your posts so we can easily share your outstanding articles my friend? okay, but wtc7 did go down, and nearby firefighters are on video saying that it sounds like demolition shots for collapsing buildings. also, never forget fhe press conference on 9/10 where donald rumsfeld stated that 3 trillion dollars were missing from the pentagon. the government did the whole darn thing to us to cover a theft and start a war which would have no possible ending. sigh. This is an issue that has taken more than two years of my time in research and argumentation counter to the nuclear and beam weapon assertions. The article is a partial treatment which is followed by fuller information in my added commentary. How could one make that determination? The entire crime scene was sold off and shipped to China…at a profit, no less. The question was were there hundreds of large structural steel columns with diagonal molten cuts at each end, at ground zero, after the buildings collapsed. People in the 911 truth movement say there were. There were hundreds and hundreds of people at the site, the rescue workers, first responders , firefighters , people who transported all that steel onto trucks, through the streets of NY out to the dump site, loading and unloading it ,besides all those who examined and photographed those thousands of pieces of steel. I have never seen or heard any evidence from anyone of steel with large diagonal molten cuts at the ends. There are numerous such photos around. I have seen them on multiple occasions. Probably AE911Truth is the place to look. In answer to A. Wright – as John Burns has replied, there are numerous photos available. Many have adduced to what you purport you have not seen or heard. You may want to take the bull by the horns, and inquire of the company who shipped and sold that steel as to the conditions of the metal. I have not seen these photos. AE 911 truth have a number of presentations and they don’t show any photos of cut steel. WHATREALLYHAPPENED.COM has these photos of the diagonally cut steel beams in the wreckage of the WTC. (they will be in his 911 section under WTC from memory) They do look like what results when cutter charges or cordex (or whatever they use these days to blast cut steel during demolition) are attached to a column to give a slant cut so that the upper part of the column “walks”/slides off. Hope this helps. Shipped off a t a profit?, actually, my understanding is that is was shipped at a loss. We would know for sure if and how many steel columns showed diagonal cuts had the evidence been preserved. However the remains of the buildings were quickly melted down and shipped to China. Where is the proof WTC 7 could collapse like that from fire? There have been highrise fires before and since 9/11 but none have resulted like WTC 7, not even close. Where is the proof OBL was the mastermind behind the attacks? (The Jalalabad tape has been thoroughly debunked). He denied involvement on 3 separate occasions. Do not be fooled into thinking the official story is anything other than a theory just like the rest. “why didn’t anyone see diagonal cuts on the columns” You wouldn’t have to cut the columns in the middle. You could instead cut the bolts holding them together. This would most likely require less of the possible thermitic material. This is where investigative journalism has failed America and the world, leaving the 9/11 lie alive to create vast never-ending conflicts that are displacing our attention from global warming. Greenwald will change his mind as his position is not based on science but hidden political considerations. One has to be careful with Greenwald. He is not 100 percent trustworthy. Proof. The ideal proof is mathematical as it is certain. Science is always theoretical or hypothetical. Something may turn up that confutes the theory. Almost anyone can follow Euclid’s proof that there is no greatest prime number. Very few people can follow the proof of Fermat’s last theorem. The latter proof took about ten years of hard mental work. People often have emotional/mental blocks to seeing the obvious. After all if people like Kevin are right, it means that our government not only is failing to protect us but will on some occasions murder us! For some grown up that is just too much to take. Some people have made a lot of money pursuing the terrorists. It has been for them a Golden Goose. All in all 9/11 was badly done. It was pretty amateur. The guy on the street who acted like an actor? had a full explanation which he was just bursting to tell the TV people–after which presumably he got a big sack of money! It was identical to the shoddy “scientific” explanation offered years later by NIST. That is just one of many B movie effects that were worked in. Viewed as a film it should have been a big money loser. Bad acting by the perpetrators and their hired hands. Just recall the strange yet canny look on George W.’s face; and how he went on to read to the kids with the book upside down! It was only successful because it was psychologically so unexpected and not because the Director was a man of genius. You can forget the science and still know it was an inside job. And about what you would expect from an American government whose reins were supposedly in the hands of Mr. Bush–fool me once . . . fool me . . . me twice (and then what?). The mismatch between your FTIR spectrum and Millette´s spectrum is interesting. I remember seeing a different spectrum in your 2009 slideshow. 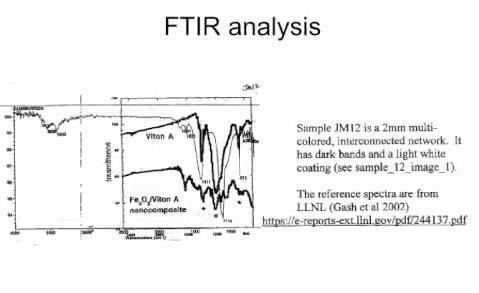 Are you going to elaborate on your FTIR data and/or perhaps publish it? Do you not think this is an important question which should be addressed by people in the 911 truth movement, in relation to controlled demolition of the WTC buildings? I have directed the question to David Chandler also but it has not been approved (it seems). Do you not think this is a question that should be asked of someone like David Chandler? “Yes early on when folks were sure that conventional controlled demolition methods were used they were looking for the angle cuts. There are not very many to say the least so that method was not used. I lead the Scientific Translation Team in China to translate the Jones, Harrit “Thermitic paper” into Chinese. Using members of the Chinese Science Academy and academics in Chinese and English, the labor of love took two years to complete. I have asked Chinese academics to answer three questions after reading the paper. 1. Did you find any scientific flaw in the study or findings? 2. Did you find any mistakes in the translation, typos, grammar, spelling. 3. Is there any way for the red-gray chips to be confused with paint? What type of energy can burn cars six or more blocks from WTC while leaving papar and vegetation unscathed? One of my favorites is the testimony of the Fresh Kill landfill workers who found melted guns under the seats of cars and they wondered what temperature it would take to reduce a pistol to a blob of metal, picture of that table full of firearms, from the customs house, in various states of melt. I like to use the term “weapons grade nano-particles” found in the dust. I have found that “Popular Mechanics” has become a Scientific Journal in America and many Americans accept that the magazine exploded the “thermite theory” many years ago. The American public seems to accept anything from the famous or the media regardless of what they say: NOVA, PBS, History Channel, Discovery, Disney, etc. These TV presentations pass as “scientific” analysis and are quickly accepted. I think the Nazi discovered that people will hear what they want, and Orwelle tells us the “Ministry of Truth” can make truth whatever is needed. Haliburton Corp’s. fracking PR is similar to the selling of the 19 Arabs myth. “what happened to everything …filing cabinets, chairs, desks…nothing but rebar, metal, and concrete” – These guys are, to me, among the most creditable witnesses. I find Dr Sarkosky’s evidence (link above) very convincing, and the Architects & Engineers for 9/11 truth campaigners have my greatest respect. You can see in Sonnenfeld’s FEMA photos that the entire wreckage of WTC7 was cleaned out first of all, right down to the basement. If that isn’t removing all evidence of CD as fast as possible, I don’t know what is. can thermite cut through the brain of Murdoch? It is utterly preposterous and a downright infuriating, that we are force-fed the nist findings , well not even touching on any of the real key points. This government dog and pony show is so pathetic, that the only ones who really would believe it would be our branch of the government they’re idiots . Very shameful. Very criminal. I have to ask: Why not just say something like “Yes, explosives were used–and we believe that the terrorists put them there!”? Why keep denying presence of thermite, for instance, if it was obviously there? It must not so obviously have been there. Or perhaps the whole building was MADE of thermite on accident, and the denial of the presence of thermite was to avoid law suits. Secondly, I was a little disappointed in this article because I thought we were going to learn how to disprove the Thermite Claim. Unless I read through it too fast, the author didn’t discuss disproving it. Thirdly, I found it very odd that I turned on the Eagle’s “Dirty Laundry” live version on Youtube at the time of my reading this article, and the lead singer Jesse Hughes says, “I’d like to dedicate this song to Rupert Murdoch” EXACTLY when the author mentions Rupert Murdoch! You might have read through it too fast, or maybe too slowly. In any case, it’s certainly the first time I’ve ever heard anyone suggest the buildings were accidentally made of thermite. And I’m pretty sure it will be the last. Well, the accidental thermite construction hypothesis might be silly, but the criticism of the article as unfinished and not delivering on its debunking promise is irrefutable. You don’t even finish reviewing the 10 arguments, stopping at two! I was very impressed at first with your collection of the evidence for the presence of thermite. But you never “debunk” the theory that thermite was used/present. If thermite was present, how the hell did it get there? If it wasn’t, then please explain away the evidence for its presence that you so meticulously review. Thank you! You want to know who did this? US Government.. They have ALL The answers..
What was the relevance of Tower 7? Why was Tower 7 destroyed? What government documents were inside of the twin towers and tower 7 that the US government wanted hidden? There were numerous SEC documents of evidence for some very high profile court cases on the level of Enron in building #7. This info can be found without too much difficulty. I heard an interview ages ago of a guy that worked in that building on a high security floor who stated this. I did not write down his name and don’t remember what show it was. I now am finding lots of strong evidence that Moussad was very much involved. Heck, they got us to fight their war for them. The government lied in reporting who shot JFK. The government lied in reporting who shot RFK. The government lied in reporting who shot MLK. The government lied about shooting down TWA flight 800. The government lied about the WTC. SO WHAT? Is there anything you can DO about it? Tell me some positive steps we, the people of America, can do about it. Most people are worried about how to pay the rent, the utilities, the kids food and clothes, next month’s credit card bills. Tell me how this investigation can solve our everyday problems. Got nothing to do with everyday problems, it is a civic duty. You can try all you want to debunk 9/11 truth movement, but the facts still remain. 1. How on earth did a complex composite, used in the military, ended up in the dust of WTC? 2. How on earth did the towers fall in the path of greatest resistance and still fall at almost free fall speed? 3. Why are there still hijackers still alive, after they were suppose to be dead? At least the truth movement’s stories don’t change. That is what I can’t say for the debunkers? As no plane struck had Building 7, what brought it down 26 minutes after the BBC news reader said that it had ? That is, when she read this out at 4:54pm, Bldg 7 was still standing over her left shoulder as part of the skyline on the tv screen, which after a minute went black when someone realised that it was still standing. At 5:20pm it began to collapse. Seems to me we can say that if it ignited at 400 and not the required 430 degrees, then why go forward with the rest of the tests? Even if 9/10 of the remaining tests qualified it, only one is needed to debunk. Now while your tests differed, that graph doesn’t show what temp yours ignited at. If yours ignited at the required degrees, then he should redo his test with more material. But there’s also the fact that there’s other stuff in that dust than just the potential thermite, which could also have the same or bigger melting point, so it’s probably not a good test, anyway – especially when a large enough sampling would be required, as well, to account for distribution of the material. Hi Kevin. I am trying to obtain a copy of your book titled ‘Another Nineteen.’ Unfortunately amazon wont ship it to Australia. Can you help?